Home > My Life Musings	> Creative? Me? There’s a new award in town! This award – the Imagine Award – was, I am reliably informed, created by Jenny over at My Fibrotastic Life – pop over and say hi! It was created in October this year, no less. That’s last year if you’re reading this next year :-). I’m in on the ground floor with this one. And look how cool it is – it’s got a unicorn and a rainbow in it! It has been awarded to me by Teepee12 (Marilyn) over at Serendipity, and I have to admit I was deeply touched by her kind description of my blog – thank you! Let me tell you a bit about her blog, if you haven’t already found it. We’re talking amazing photos (sometimes aided by her other half), social commentary, light-hearted rants, all the time accompanied by a most wicked sense of humour. She manages to see the light side of many not-so-light situations. It is a most amazing blog – do visit! The description of this award states that it was “made in order to recognize the bloggers who express their passion and dedication towards their blogs through their creativity”. Teepee has listed some qualities which make a blog “creative”. Words – my blog contains no end of words. They’re everywhere on my blog. Poems, fiction, musings and whatnot. Graphics – I have photos, doodles (both hand and computer drawn) and cartoons. Video – I’ve included one video. It was sort of a “Blair Witch Project” type of affair, except that mine was shot on my phone in a darkened bathroom while wearing a coat and sunglasses, illuminating my face with a torch (that’s “flashlight” if you’re in the US) and affecting a Scottish accent (and calling myself “Angus MacScotland”). Layout – hmm, moving on. Community – I have a little bunch of treasured bloggy friends plus some very welcome visitors! Copy and paste The Imagine Award into your post. Thank the blogger who nominated you and link their blog page to your post. List 3-5 things about the nominator’s blog that you like (which you think are very creative). Nominate 5 other bloggers/blogs which you think display a fantastic use of creativity and imagination. 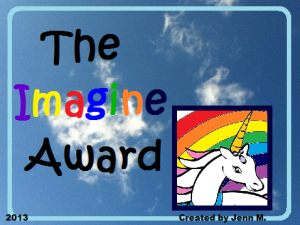 Display The Imagine Award on your blog’s award page. Six whole rules! At least I don’t have to answer any awkward personal questions for this one. And why not? Because this award is all about celebrating others’ creativity and imagination. Here is a picture of me dreaming up creative ideas, in (an approximation of) the classic “thinker” pose. As you can see, I am lost in thought, dreaming up no end of new things! And so, on with the nominations. I realise that some of you may not do awards, or you may have already been nominated for this award by someone else. However, I am nominating you because I enjoy your blogs for, among other things, their creativity and your imagination. Feel free to accept or not but I hope you will welcome the plug! The Queen Creative! A joint venture between the afore-mentioned Rara and her husband (who also has his own site). Author, illustrator, creator of pictures to download and even a little game for us to play, freebies and all sorts going on over at The Queen Creative! Evil Squirrel’s Nest – this guy has created a whole host of fun characters around which he has built his blog. There’s retro ads for nostalgia, cartoons featuring his characters, tips on how to draw characters like his and much more! His characters even have their own back stories! Buffalo Tom Peabody – this blog features a collection of cute characters in various costumes (depending on the circumstances)! Just have a look at the cute little Gunther Tootie in his police uniform. Currently I’m enjoying a series of Halloween themed posts, courtesy of Count Buffalo Tom (cool fangs). There are also cool video clips of BTP – I wish I knew how to do animations like that! aliceatwonderland – great posts on all sorts of subjects, video clips with commentary and even a club you can join (Sparkleponies)! She has shown us many ways to kill off Sims characters. She really knows how to draw in the readers, and she’s also one half of The Wonder Twins. She even (along with her kids) produced an actual Sparklepony to give away in a competition. Which I didn’t win. I was beaten by, among others, the afore-mentioned Evil Squirrel :-(. So there you have it. Happy creative blogging everyone, and do be sure to visit these amazing blogs! Congrats on your award, it’s completely well deserved for all the reasons Marilyn mentioned. And… awwww! Thank you, thank you! You’re so kind! And you are more than deserving. Your blog is fun, thought-provoking and intelligent. Haha, I don’t think it’s cheating at all. 😀 We put on entirely different blog hats when we work out of there. 🙂 Thank you on both counts!! Thanks for the award and most importantly the great stuff you said about my blog! I have been feeling quite uncreative lately, so this was a boost. Thanks. You’re very deserving of it! I’ve not been following you long relatively speaking but I’m enjoyed every post. Funnily enough, I was feeling the same way as you until I was nominated, along with some very kind words from Marilyn at Serendipity – it gave me a boost too. Thanks for the compliments! I wish I had the capabilities to comply! Thanks again for the nomination, I feel so honored! Yours is a very imaginative and fun blog and so very deserving of the award! Congratulations to you and all the other winners!